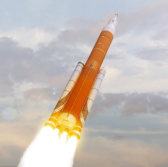 NASA plans to move on Thursday, Aug. 30, the mobile launcher for the Space Launch System to a launch pad at the Florida-based Kennedy Space Center using a diesel-powered crawler transporter, Spaceflight Now reported Monday. The agency will then transfer the mobile launch platform to the vehicle assembly building at KSC by Sept. 8 to begin a series of validation and verification tests. “We decided to go to the pad first,” said Bill Hill, deputy associate administrator for exploration systems development at NASA. “We’re going to do fit checks, and then if we find anything we need to fix while we’re in the VAB, we’ll have time to fix those,” Hill added. Prior to the scheduled move, NASA installed umbilical connectors, vehicle stabilizer, tail service masts, crew access arm, purge and fueling lines for the SLS rocket and the Orion spacecraft that will lift off from launch pad 39B in mid-2020 as part of an unmanned test flight mission. Testing work at VAB will include the assessment of the mobile launch tower’s thermal control, ground special power and launch release subsystems, a spokesperson for NASA told the publication. Hill said NASA expects the mobile launcher’s testing phase at VAB to conclude by the third quarter of 2019.